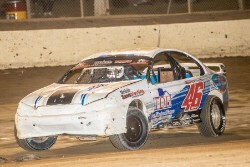 Fifty three Modified Sedans have nominated for this weekends PS Designer Homes T-Bar National to be held at Hi-Tec Oils Speedway this Friday and Saturday nights. The field includes drivers from Western Australia, Victoria and New South Wales all keen to take on an impressive list of Queenslanders, just weeks out from the National Title. The list is headed by Queensland Champion, Aidan Raymont, but as you scroll through the list, there are top drivers at every turn. Added interest will come from one of Australias most prominent Super Sedan drivers, Matty Pascoe who will turn his hand to Modified Sedans over the two nights. Victorian, Kye Walters has won six Feature Races this season, dominating the Victorian Series, and recently won the Tasmanian Title, and will take it up to Raymont. Others in the field include Greg Worling who recently won a major event at Lismore, former National Champion, Max Clarke, Rodney Pammenter and Brett Baxter are also entered, promising that the T-Bar Nationals will be one event not to miss. On Friday, Junior Sedans will also be on the schedule, while the Junior Sedans will be joined by Super Sedans on Saturday night.